(Bloomberg) -- General Motors Co. was given a higher credit rating by Standard & Poor's Ratings Services than Ford Motor Co., the only major U.S. automaker to avoid bankruptcy last year. The credit service today said it assigned GM a BB- rating with a stable outlook. It had previously given Ford a B+ rating with a positive outlook. GM's rating is three levels below investment grade. The federal government owns 61 percent of GM. “Despite weak recovery prospects in Europe, we believe GM has good prospects for generating positive cash flow from its global automotive operations for the rest of 2010 and all of 2011, as the key U.S. auto market gradually recovers and demand in China and Brazil remains robust,” Robert Schulz, a Standard & Poor's credit analyst, said in a statement. 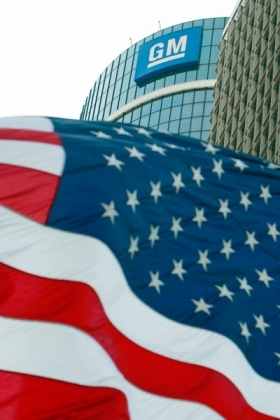 The rating comes a day after Fitch Ratings gave GM a BB- rating, the same as Ford's. GM and the U.S. Treasury aim to hold an $8 billion to $10 billion IPO in November, two people familiar with the plans said last month. * Detroit-based automaker General Motors Co. (GM) was formed in July 2009 to acquire most of the assets and certain liabilities of the former General Motors Corp. out of bankruptcy. As a result, new GM has a much lower debt burden than the old General Motors Corp. had and is profitable in North America. * In the second quarter of 2010, GM reported EBIT of $2.0 billion, an EBIT margin of 6.1%, and cash from operating activities of $3.8 billion. * We believe GM's global automotive operations will generate at least mid-single-digit pretax margins and positive operating cash flow in 2010, and there is potential for improvement in 2011 because of a gradual recovery in North America. * We are assigning GM a corporate credit rating of 'BB-'. The outlook is stable. * We assume that GM will continue to be profitable at the EBIT level in North America and on a consolidated basis. NEW YORK Oct. 7, 2010--Standard & Poor's Ratings Services said today that it has assigned its 'BB-' corporate credit rating to General Motors Co. The outlook is stable. * The rating is not dependent upon completion of an initial public stock offering. We view GM's business risk profile as weak and its financial risk profile as significant. Under our criteria, the combination of these profiles is consistent with a 'BB-' corporate credit rating. We view GM as a government-related entity (GRE) under our criteria because of its current 61% ownership by the U.S. Treasury. However, we view the link between GM and the U.S Treasury as limited, because we believe the Treasury's ownership position will decline over time. We also view GM's importance to the government, under our GRE criteria, as limited. Accordingly, our 'BB-' corporate credit rating on GM reflects our opinion of the automaker's stand-alone credit profile, because we believe the likelihood of government support is low, as defined under our GRE criteria. We believe the company and its shareholders intend to complete an initial public offering and that existing shareholders, rather than GM, will receive the proceeds from a common stock offering. "We assume the company's automotive operations in North America will remain profitable if U.S. light-vehicle sales are at or above current levels (that is, more than 11 million units on an annualized basis), largely because of cost reductions that have lowered its breakeven point of sales," said Standard & Poor's credit analyst Robert Schulz. "Despite weak recovery prospects in Europe, we believe GM has good prospects for generating positive cash flow from its global automotive operations for the rest of 2010 and all of 2011, as the key U.S. auto market gradually recovers and demand in China and Brazil remains robust." * Execution risk of returning its Opel unit in Europe to profitability. Our business risk analysis also incorporates our view that GM's financial results remain highly sensitive to future sales and product mix trends, actions by competitors, and other factors such as higher raw material costs or fuel prices that are beyond its direct control. The company reported a second-quarter EBIT pretax margin of 7.9% in North America. We believe significant improvements from this level of profitability will be difficult in the near term, and margin may decline as costs increase and production flattens or declines on a sequential basis. Still, we believe GM's global automotive operations should generate at least mid-single-digit EBIT margins, including in Europe, where the market remains weak and GM's operations are unprofitable. Second-quarter global EBIT margins were 6.1%, and global automotive cash from operations was $3.8 billion. We expect GM to generate positive cash flow in its global automotive operations in 2010 and 2011 (before any voluntary pension contributions). Standard & Poor's forecast U.S. light-vehicle sales of about 11.4 million units in 2010, 9.6% higher than 2009 levels. We currently expect sales to rise to 12.8 million units in 2011; even with this improvement, sales would be below the levels of 2008, which we considered weak. Our outlook for the major auto markets in Europe, GM's third-largest market, is more negative. We expect sales in Europe to be 6% to 8% lower in 2010 than they were in 2009, in part because of the shifting of sales to 2009 caused by various government scrappage incentives that have now ended. GM and other high-volume automakers in Europe benefited from these incentive plans, but we believe the boost to sales is over-–although several automakers are replacing the government-sponsored incentives with higher incentives of their own. Accordingly, European production levels could be lower in the second half of 2010 than in the first half. We believe GM's pretax losses in Europe will continue for at least the rest of 2010. We expect tough competition and the complications related to the turnaround of its Opel unit to hurt 2011 results in the region. We expect GM's international business segment (mainly Brazil and joint ventures in China) to remain solidly profitable and cash flow positive. EBIT margin including equity income from joint ventures was 7.8% in the second quarter. We view GM's lower debt burden as a positive credit factor. Still, the company does have some debt outstanding and significant postretirement benefit obligations (largely pensions). We view the Series A preferred stock as debt-like, because we believe the company could repurchase this stock before its 2014 maturity. Most of the company's $8.2 billion in debt (as of June 30, 2010) represents various lines of credit and borrowings outside the U.S. and $2.9 billion (including accrued interest) due to the United Auto Workers' VEBA retiree health care trust. GM has stated it may prepay this VEBA note from available cash. We estimate that adjusted debt to EBITDA will be about 4x or lower over the next year if GM makes some discretionary pension contributions; we assume lower discount rates will cause an increase in obligations. The company has applied to borrow funds from the U.S. Department of Energy to bolster capital investment in new technologies and we would expect that GM would borrow under this program if approval is granted. Still, we believe the company's lower cost base and a slow recovery in U.S. light-vehicle sales, taken together, have greatly reduced the risk that GM's liquidity position would revert to dangerously low levels in the next few years. The company's annual automotive debt maturities are $1 billion or less annually. If the company completes an initial public offering, we expect existing shareholders to receive the proceeds rather than GM. The company also has filed plans to sell mandatory convertible nonredeemable Series B stock in conjunction with the offering. We believe GM would receive cash proceeds from this Series B offering. Unlike most global automakers, GM no longer has a large captive finance unit. It relies on agreements with recently purchased subprime lender General Motors Financial Co. Inc. (formerly AmeriCredit Corp.), its former unit Ally Financial Inc., and other banks. As such, it does not own a traditional captive finance operation. We believe GM will seek to expand its captive operations, but in our view this process will require substantial capital redirection and entails execution risk in our view. The results of GM's financial services partners will be aided, in our view, by an improved market for used vehicles--which would lead to lower costs related to lease residuals--and by reduced credit losses as consumer credit quality stabilizes at many financial institutions. We believe residual values will remain volatile and a risk to GM's future results. The outlook is stable. For the rating, we expect GM to generate adjusted funds from operations to debt of about 20% and positive free cash flow from operating activities (before any large voluntary pension contributions made from existing cash balances). We also assume that GM will continue to be profitable at the EBIT level in North America and on a consolidated basis. We could raise the rating if, among other things, the gradual improvement in light-vehicle demand continues in most global markets and GM's prospects for generating free cash flow and profits in its automotive manufacturing business continue to solidify. For example, we could consider raising GM's rating if we believed its funds from operations to adjusted debt next year would be at least 25%. This would likely require a continued gradual economic recovery. Other positive rating considerations would be if GM can sustain its pretax automotive profit margin in North America in the upper–single-digit percentage area, successfully diversify its product line-up with a profitable line of fuel-efficient cars, and continue to cope successfully with the evolving competitive structure of the global auto industry, including reaching profitability in Europe. "We could lower the rating if adverse economic or competitive developments (for example, overproduction, excess inventory, increased incentives, or unfavorable shifts in customer demand) reduced the prospects for profitable and cash-positive results in 2010 or 2011, or if the company were to use a substantial amount of cash in its automotive operations in any quarter," Mr. Schulz added. * Key Credit Factors: Criteria For Rating The Global Automaker Industry, Oct. 1, 2010. * General Criteria: Enhanced Methodology And Assumptions For Rating Government-Related Entities, June 29, 2009. * Criteria Methodology: Business Risk/Financial Risk Matrix Expanded, May 27, 2009. Complete ratings information is available to RatingsDirect subscribers on the Global Credit Portal at www.globalcreditportal.com and RatingsDirect subscribers at www.ratingsdirect.com. All ratings affected by this rating action can be found on Standard & Poor's public Web site at www.standardandpoors.com. Use the Ratings search box located in the left column.